I mentioned before the patch that I had saved up a lot of CXP packs in anticipation of Command tier four. 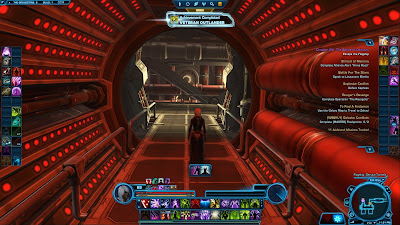 One more reason to be antsy about the patch's release was that I was running out of space to store the things if I didn't want to start redistributing them on alts, so I was really keen on finally being able to clean out my cargo hold, inventory and mail box. Of course, nothing is ever that easy. To get the most out of all those packs, I wanted to wait with claiming them until my alignment (light side) had had a victory. Unfortunately, this doesn't happen very often on TRE right now, and I'd say there are about two dark side victories for every light side victory. I won't be so melodramatic as to say that light side never wins, but it's certainly proven elusive over the last couple of days. I tried staying up late in the evening, but even though my side was gaining, it was so slow that I eventually had to give up as I was falling asleep at the keyboard and had work the next day. Other times I always seemed to just miss it, with the victory popping just after I had to leave the house for an appointment or just before I came home from work. It was growing kind of aggravating! 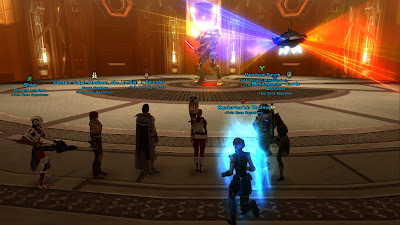 Then, yesterday at around 6 in the morning, I logged on to finally find the light side at stage four already, and claiming victory shortly afterwards. Hurrah! What followed were several hours worth of inventory management, which is one of those things that you either enjoy or you don't, and I definitely did enjoy it in this case. 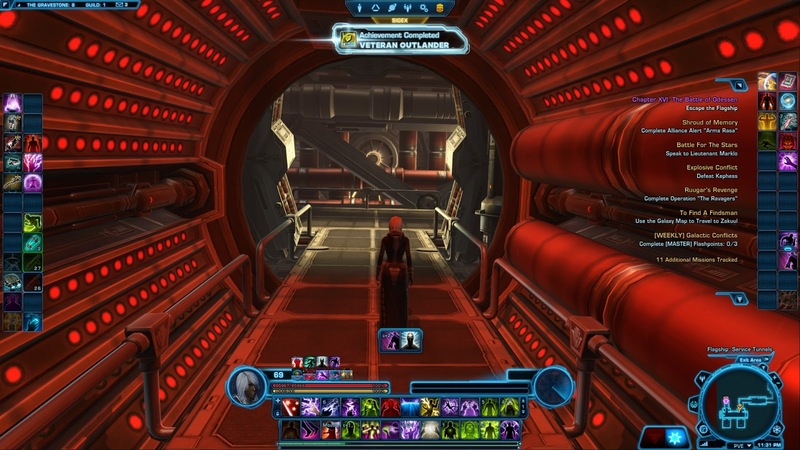 I'm happy to report that all those CXP packs translated to a respectable 86 Command crates. And let me tell you, opening so many of the things at once is pretty fun! I actually purchased all the Command stash extensions, a UI feature that I had always considered pretty pointless before then, but if you open that many crates at once it's actually pretty nice to be able to let the loot pile up for a bit without having to worry about claiming or disintegrating things every other crate. Plus it allowed me to be strategic and for example leave the blue gear pieces in the stash at first without claiming them, in hopes of getting a purple or even gold for the same slot out of one of the later crates. I'm happy to say that it worked out pretty well for me, and I received an upgrade for every single gear slot. Sure, most of them were blues, and while they feel less prestigious than the purples we're used to and I'm still not convinced whether it's a good idea to even have all these tiers within tiers, everything was at least an upgrade. 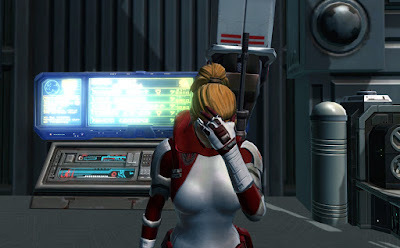 It seems that Bioware has finally found a sort of balance with tier four, making me reconsider Command rank 300 as a worthwhile goal for some of my alts. Fiery Grophet seeking to camouflage itself on a carpet. The thing that came as a surprise for me were the pets. I'm not a pet collector, so I have to admit I have a pretty short attention span when it comes to caring about them. 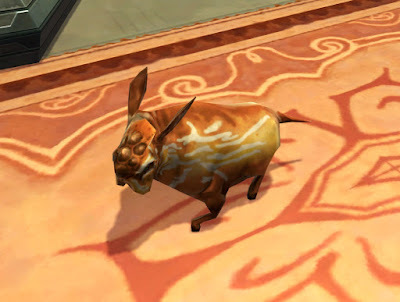 Sure, I'll usually go "that's cute", but by the next day I'll already have forgotten that I even got a new pet the day before. But this tier had a grophet as one of the rewards from the crates. I've written before about really liking those. And the other pet was a cute green froggie with spots! D'aww. But then the duplicates started rolling in. I hit disintegrate on a grophet and immediately felt a terrible jolt of guilt. It doesn't really make sense. I don't worry about what an uncomfortable life these creatures must lead, being stashed away between armour pieces and companion gifts inside of crates that mysteriously appear out of thin air. But when you ask me to take action myself, to actively destroy them... I suddenly feel bad. It's one thing to "disintegrate" a piece of armour, but a cute little animal? 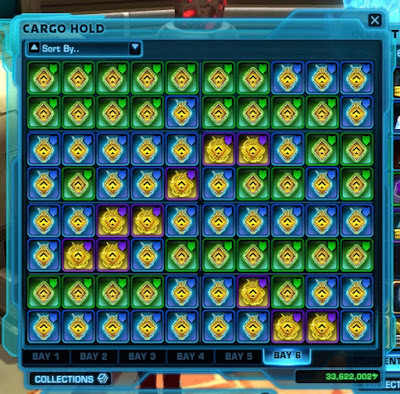 I'd always felt a little bad about it before, but the grophets were more appealing to me than the usual offerings, and due to opening all of those crates at once I had quickly accumulated a whole stack of them. Seven little grophets... sounds like the name of a fairy tale! Eventually I went "to hell with it", claimed them all and sent them round to my alts. 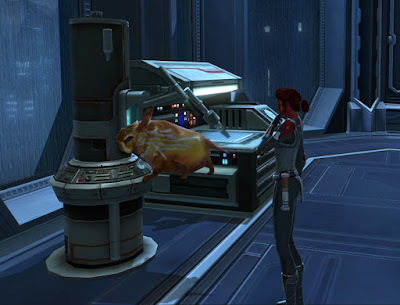 Who wouldn't want a cute little potato creature with spindly legs by their side? My Marauder's also seems to have an interest in slicing, who knew? It's a shame that you can't have more than one copy of a pet in your stronghold, or I could open Shintar's Home for Fiery Grophets in one of them. It's strange in what sort of directions playing a game like this can take your thoughts sometimes. 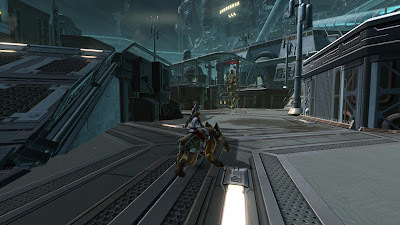 Replaying KotET and more recently also KotFE got me thinking about the role and importance of NPCs in MMOs, probably because both expansions have been criticised for putting too much focus on certain non-player characters, to the point where they feel more like the story of Valkorion, Lana & Co. than our own. How much of a role should NPCs play in an MMO? Do we need them at all? I think the answer to the latter question is probably no, if we're talking about truly "needing" them. 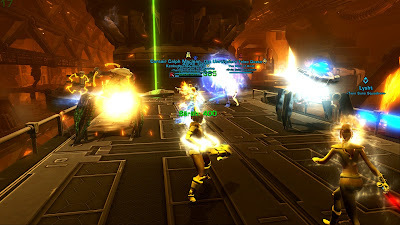 I suppose a complete lack of non-player characters would be challenging in terms of handling certain game mechanics (such as how to create and distribute currency for example), but that aside it's not that hard to imagine an MMO in which players literally only have each other to interact with. It would be the ultimate sandbox. But it is desirable? I could imagine such a game being fun, but I fear that if there were multiple games like it, they would be at risk of feeling a bit same-ish. As a collective, MMO players are not very good at building a coherent and interesting culture. Put a lot of them together and it seems you inevitably end up with a lot of people with silly names and a penchant for making crude jokes. That could be a fun setting once or twice, but you wouldn't want all your games to be like that. 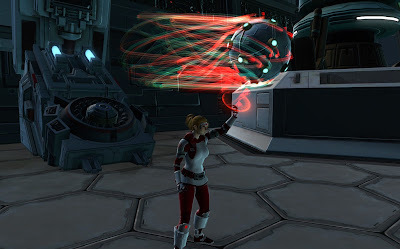 I want my MMOs to have an interesting setting and lore, and for that it still seems best to have that part actually put together by professionals. NPCs are one way to achieve this. Even if they were set up to never talk to or otherwise interact with players, their mere presence would already tell us things: about what sort of society they live in, what sort of settlements they have, how they dress, what sort of roles they play. Once you get them talking, things only get more interesting and stories get told. It seems to me that when it comes to NPC interactions, you can have a spectrum that goes from disinterested and independent to highly attached. The former means that NPCs talk to and trade with you and may even give you quests, but have little to no interest in you beyond that. Once you're done with them, you move on and probably never interact with them again. I remember Vanilla WoW being a lot like that. This can then lead to people accusing the game of having little or no story - but this isn't necessarily true, the story just isn't as in-your-face. Vanilla WoW actually had some very interesting stories, you just had to actively pay attention to quest text and connect the dots. And they were rarely about a single hero and more often about whole political factions or worldly developments (e.g. 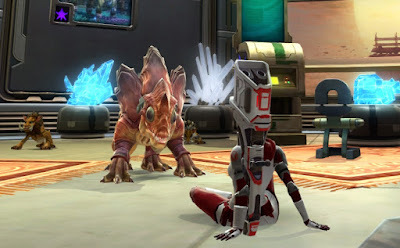 multiple quests having you investigate Silithid hives in different zones slowly drawing a more comprehensive image of what was going on with them). 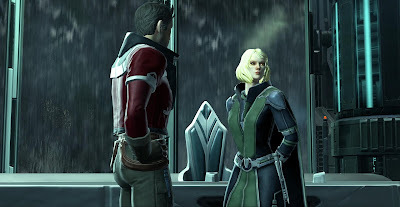 On the opposite end we have Bioware's companions: NPCs that pretty much attach themselves to you, follow you around and become your best friends or worst enemies. It seems to me that merely telling stories that way has become almost synonymous with "good storytelling" simply because it's impossible to miss. The more distant approach requires players to be curious and interested in puzzling things out for themselves, which can be fun and rewarding. But if you're not into it, that story might as well not exist. Comparatively, the guy who constantly follows you around and comments on everything you do is hard to miss, and suddenly there's a story for everyone. Of course that approach has its pitfalls too. Players who enjoy puzzling things out for themselves might perceive a story delivered in a pushy manner as "dumbed down", but more importantly you might piss people off by (semi-)permanently saddling with with companions they don't even like. 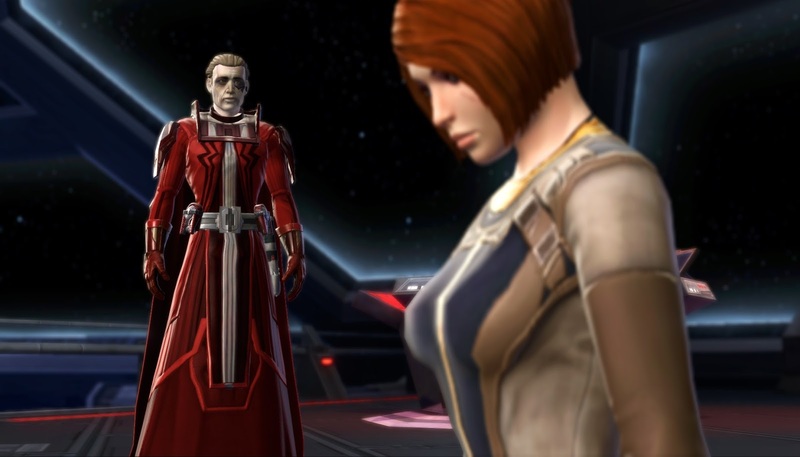 Theron Shan and Lana Beniko in SWTOR are a good example. 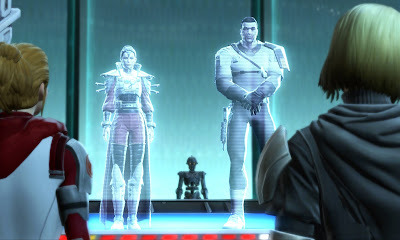 They were originally introduced with the Forged Alliances story arc in early 2014 (yes, that long ago), initially just as contacts that guided you through the different steps of the story, just to rise to further prominence in Shadow of Revan until they became permanent companions in Knights of the Fallen Empire. Both are written in a way that tries really hard to make you like them. They may disagree with what you say at times, but they remain unfailingly loyal no matter what. They are also both skilled individuals and highly useful to have around from a purely pragmatic point of view. Lana is more of a quiet, thoughtful type, while Theron likes to crack wise on occasion, but both are likeable archetypes. And it works! They are popular with a large part of the player base and many have entered into a romance with one or the other. But there are reasons to dislike both of them too. Lana is manipulative and somehow always gets things to go her way. It's not unreasonable to want to break free of her grasp. Or maybe you're just sick of Theron's forced levity and want to get rid of him. Yet you can't. On occasions you may be able to say rude things to either of them, but as mentioned above, they are unfailingly loyal to your cause... which only gets more annoying as you try to drive them away by being mean. 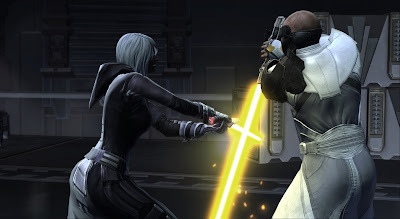 Pfannenstiel mused in his own comment section the other week that it would be interesting if after the choice on Iokath either Lana or Theron would turn against us. Sure sounds exciting to me, even if I don't think it's likely to happen and I don't even really dislike either of them. But being forced to hang out with them all the time is not optimal either. 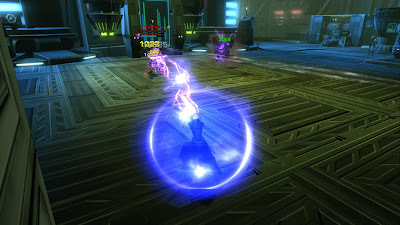 And I do think this is one area where KotFE/KotET suffered a bit, in that they tried too hard to make the conflict between you and Arcann and Vaylin personal. I never liked the Sith inquisitor's chapter three because it uses a similar set-up: The villain wants you dead for personal reasons, so you must personally want them dead too. No, that's not how it works! Maybe the "Knights of" story would have actually been stronger if there had been more of a focus on why Arcann and Vaylin's reign was bad for the galaxy as a whole, beyond some occasional mentions of how they were cruel to their people. That would have provided more opportunities for the player to find reasons to want them dethroned and given us back some sense of agency. Still, on the whole I like having some NPCs around that serve as recurring characters and with whom you can develop a relationship. I just think it's best balanced out with also having characters on the other end of the spectrum, to remind the player that the world doesn't revolve around them and that there are other stories out there that are worth actively discovering too. SWTOR did used to have those as well by the way. The other week I finally finished up a long-running project of mine, which was to make a video about the Dread Master story arc. Sure, the Dread Masters were recurring characters too, but not in the "core" story content, and you had to actively seek out those extra stories and figure out how they were all connected. The Masters themselves weren't actually very fleshed out in terms of personality (aside from Calphayus, we don't even know what species they were), but they didn't need to be either - they did a lot of directing events from the shadows, and on the few occasions when you did meet them directly, they almost always made it very clear that they didn't think very highly of the player character. But that's what made them fun: chasing them, proving that you were worthy of attention and that you weren't going to let them get away with their plans. 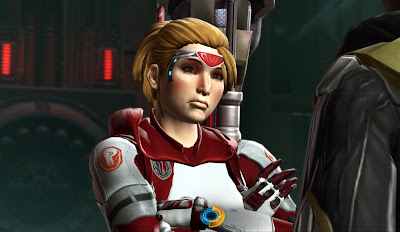 Do you have any favourite NPCs that you think are underappreciated, or clingy ones that you just wish would leave you alone already? 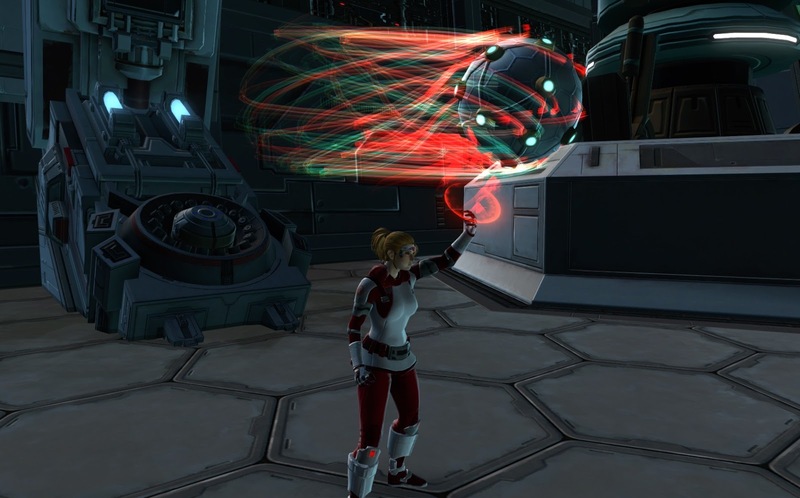 Patch 5.2 looms on Tuesday, and I've talked about many of the reasons why I'm looking forward to it. For the past couple of weeks, I haven't felt like playing much however, and that's due to what I consider the patch's biggest mistake, which is adding another tier of gear less than six months into the new expansion. I get the purpose of gear resets and don't mind them every now and then, but having them too often really serves to drive dedicated players away. It was one of the things that put me off WoW towards the end of my time there, that they started to have a gear reset every single patch. You could see the expiration date on your hard-earned raid drops pretty much the moment you got them, and the time until then always felt too short to let you truly enjoy the rewards for your achievements. When you know that anything you earn will become obsolete very soon, it really saps your drive to keep logging in... and if this planned obsolescence keeps happening at very short intervals, at some point it hardly feels worth working on anything at all anymore. So yeah, trying to get any more tier 3 gear has felt a bit pointless when the first tier 4 box I'll earn will already have better stuff in it. 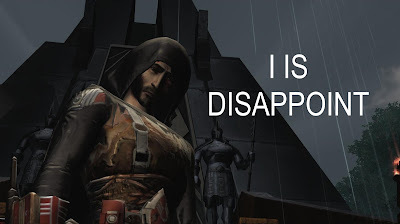 There's no use crying over spilled milk, but I do hope that Bioware has taken note of the less than positive reaction to the original tier 4 announcement and will avoid another early push like that. On the plus side, I've been able to save up a bit, in the form of nearly two cargo bays full of various CXP packs. I expect that popping all of those at once (only after the light side has won, obviously) will be pretty fun. I haven't really felt motivated to get an alt to Command Rank 300, because as I've observed previously, it doesn't really do much. I've just pushed a couple of them a bit closer towards the middle/end of their current tier so that they'll immediately benefit from the changes to drop rates from crates come patch day. Aside from more gear for everyone, Bioware has also told us that there will be even more things to look forward to than we originally thought - for example there will be quality of life changes to quick travel, and while this tweet about master mode uprisings almost seemed to come as an afterthought, I'm looking forward to trying those with my guildies too. My interest may have flagged a little as of late, but I expect patch 5.2 to provide me with enough new things to post about for at least a month. 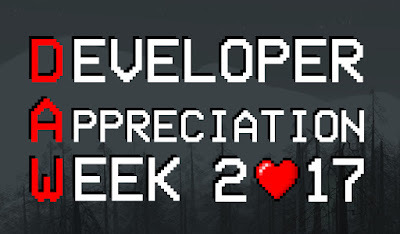 It's Developer Appreciation Week, and if you don't know what that is, Rav lays it all out in detail here. 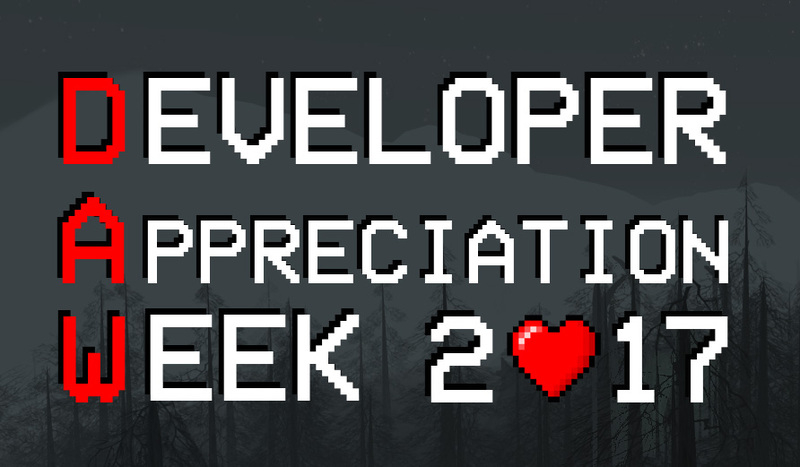 I've actually been meaning to take part in this for ages, but this time around it has come at a particularly convenient time for me as I've been bouncing around ideas for a post that fits the theme quite well. You see, in the past year I've really developed an appreciation for the difficulties that MMO devs struggle with in terms of balancing new content with bug fixes, and just generally keeping an MMO running smoothly. This is due to things that I've seen happen at my place of work, even though my job has nothing to do with gaming at all. You see, I work for an online business that sells opticals (glasses and sunglasses). Seems quite different from running a video game, right? Well yes, in the sense that we do deliver an actual physical product by the end of the day. 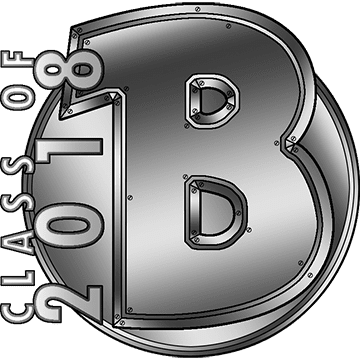 But our entire image rests on our online presence, and before customers get to actually hold their purchase in their hands, it goes through several steps of electronic processing in our back-end system as well, as stock levels get updated and so on. Even though that seems a lot more straightforward than managing a whole virtual world, I've been astounded by the amount of work it takes, and just how many things can go wrong. I don't work in tech myself, but we have an open-plan office and my department is right next to IT, so one can't help... overhearing certain things. Not to mention that we do our own share of bug reporting. For example, our website was originally built something like a decade ago by the guy who started the whole business... and who isn't with the company any longer, so tech has been spending a fair bit of time cleaning up code that only made sense to the founder himself and generally been trying to understand how certain systems were set up. I'm sure that's also true for more than one MMO that's getting long in the tooth by now. Then there are the constant small bugs. Like that certain page updates lose their header if you hit save first instead of hitting publish right away. Or orders getting stuck at a certain point in processing. Or customers sometimes being told that their payment failed even though it succeeded. Everyone is aware of them, but there just isn't enough time in the day to fix them all, considering how many other things take priority. People have just learned to hit publish right away. Orders getting stuck is bad, but you can always get customer services to manually kick them onto the next stage, and that solves the immediate problem, right? Problems with payments are really bad, but if it only happens occasionally and it's not immediately obvious what the issue is, IT can only waste so much time on randomly fiddling around with attempts to reproduce the problem - again, customer service can patch things up until there is a larger sample size to draw conclusions from. 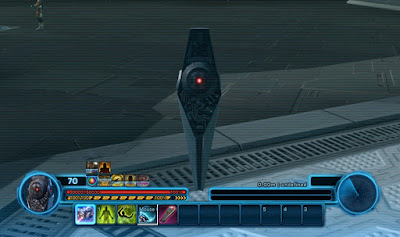 These are things I always think of now when I encounter a long-standing and annoying bug in SWTOR. Is it annoying? Yes. But is it actually game-breaking for a sufficiently large number of people? Probably not... And I'd like to imagine that somewhere at Bioware, someone is also aware of that bug and wishes they had time to fix it or knew what exactly caused it to at least make fixing it faster and easier. But in a business with limited resources that has to prioritise things we can't always get what we want. You'd think that if you "just" have a website to sell things, you shouldn't need that much tech to keep it running, right? But no, we too have our equivalents of "content patches", when the business decides that the product pages need redoing to entice more customers into buying or wants to add extra payment options to the checkout. None of these things implement themselves, so these projects constantly vie with attention for things like bug fixes. Until you have those days when something suddenly breaks down completely (e.g. the website doesn't work) and everyone needs to drop what they're doing anyway because that problem needs fixing more urgently than anything else. I imagine that's what things are like at Bioware when a server collapses or a major exploit gets discovered. Basically, what I've learned in the past year in particular is that even something that looks relatively straightforward on the surface can hide a multitude of moving parts underneath, which require a lot of maintenance and are in constant danger of breaking. I imagine that this is multiplied tenfold when you're not just dealing with a website and an order system, but with a whole virtual world with dozens of interconnected systems. 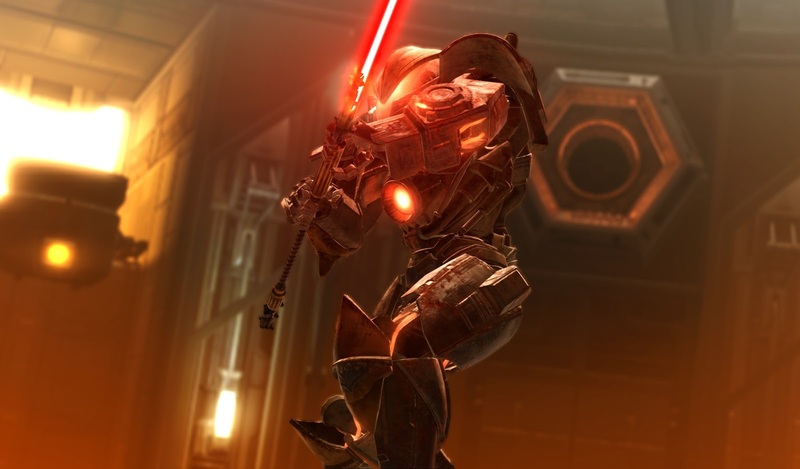 I appreciate that the devs at Bioware work hard every day to keep things running while also adding new content to keep us all interested. I firmly believe that they're genuinely trying to do their best, but sometimes there are only so many hours in a day. Just keep up the good work.